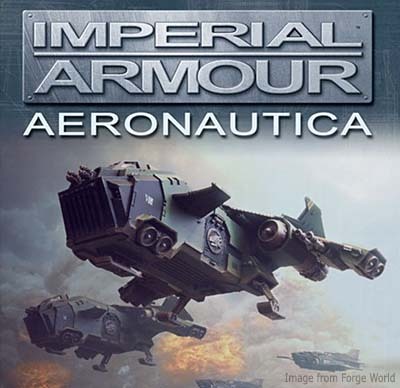 The upcoming Aeronautica book from Forge World looks like it should do a great job of expanding the whole new aspect that has been added to the game of 40k with the release of 6th Edition. The concept of flyers. Now the war moves off the ground and into the sky above. While the new rulebook has rules for flyers in it, there are only a few models right now that can make use of the new rules. Not every army has got them just yet it seems. The Imperium (Space Marines and Guard) make out the best so far using the rules from the book. They have four choices between them to choose from. Most armies don't have any flyers right now... unless you pick up this new book. It promises fully updated 6th Edition rules for 34 flyers and 13 anti-aircraft units fielded by the Imperial Navy, Space Marines, Orks, Eldar, Tyranids, Tau Empire, Necrons, Dark Eldar and Chaos. They also toss in rules for two brand new aircraft: the Space Marine Storm Eagle Assault Gunship and the Imperial Navy Avenger Strike Fighter. In addition to the vehicle data sheets, this book also adds wargear and special rules unique to flyers (new rules and wargear?). I do hope they include the data sheets for the few vehicles that had their rules already published in a previous issue of White Dwarf. It might be tough for folks to get a hold of those rules otherwise. All in all, it sounds pretty cool actually. Looks like this might be a nice blend of Forge World and Games Workshop stuff and not just Forge World doing their own thing. My one concern is the price... with Forge World making the lion's share of the new flyers, will that be a hurdle for some gamers? I wonder if the larger priced vehicles will be the one reason gamers opt out of using flyers in their armies. Maybe flyers will really shine in things like Apocalypse, but not your smaller point games. It will be interesting to see how they are used too. Will folks use them as dedicated air support or another form of transports for their troops. Either way, I'm looking forward to bombing runs, missile strikes and fielding anti-aircraft capable units. I can tell you I really like the Crash and Burn rule in the new book too. Massively over-priced and fairly ineffective. Needless to say, these rumours that Forgeworld will be writing Codexes worry me some. If they get the designers from GW to have more of a say it should be alright though. All that said, I do share your concerns about a "two-tier" 40k - gamers who can afford the expensive resin kits get all the fun and the normal guys get left out. It'd be a horrible feeling to think I won because I had all the toys and my opponent couldn't afford them. As a capable man like yourself often shows Ron, if the model price was to be an issue the punters could easily DIY a counts-as flyer for the FW rules with the same general size and aesthetic using GW parts, GS and Plasticard. This looks exciting, thanks for doing a write-up! Ant: Not all of Forge World's stuff falls into one of those two categories... some of their stuff is alright... sometimes... right? Redscorps: Very true Sir. I bet depending on how well they do in the game, we could definitely see an increase in DIY vehicles (cardstock and foamboard). I've actually see one or two already since the recent flyers came out now that I think about it. ED: Thanks, glad you like it. "I wonder what kind of work that would involve...", famous last words if I ever heard them! I usually really enjoy FW stuff, the background in the books especially. When it comes to rules I do have to agree with Ant, individual units usually seem to fall short of practical use in normal 40K games. Take the Decimator for example, fantastic design with off point cost and a weird combo of abilities. Most of the ones I've seen in action are Chaos Dreadnough stand-ins. I get the same feeling from many of the FW armylists, they just try to squeeze too much stuff into most of them. The unique armylists, like for example the Badab Tyrant's Legion and Vraks Renegades, do a much better job at providing a fun, yet not completely uncompetitive force. 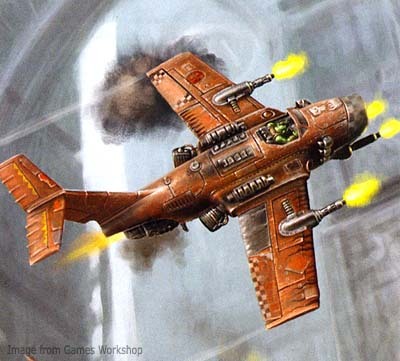 As for scratchbuilding some of the more specialist FW flyers, quite challenging but quite doable for the more mechanical-oriented races like the Guard, Space Marines and Orks. The Xenos players have a tougher time, particularly the Eldar who's normal design is a huge challenge to replicate yourself. Hephesto: Good point about the scratchbuilding. The mechanical stuff would be much easier. That being said, it's still something I struggle with when it comes to plasticard. TheTrans: Forge World stuff brings a different aspect to the game and lots of folks have strong feelings about the changes it can bring to the game in terms of balance. Hopefully the new books will have a good balance to them which will certainly help the new edition. TheTrans: I too would love to see the FW stuff brought into the game and "permitted." Even if GW permitted all of it and made a separate format (kind of like Magic: The Gathering does) that allows for the use of it and such, that would open up so much more to folks in terms of models and hobby. TheTrans: You know what, I'm not sure the book is going to be worth it in the end. I'm working on a post about it that I should have up in a couple days. It's interesting once you get into the actual contents of the book.